A hundred years ago this week… Tidings of comfort and joy did not abound, despite a considerable diminution in the fighting on most Fronts because of winter. Quite specifically, the Allies rejected the perhaps-none-too-heavenly peace proposals put up by the Central Powers; despite US President Woodrow Wilson’s willingness to broker negotiations, the Allies’ London conference beginning on December 26 had reached “No” by the 30th – in part because the terms proffered seemed to favour their enemies outlandishly, maybe in part because of over-confidence that victory was imminent (any number of other reasons might be adduced too, no doubt). So the French had to deal with a German artillery attack at Mort Homme, Verdun (December 28), while, on the Eastern Front, a Russian/Latvia force had a great success in The Christmas Battles (23-29) taking Jelgava, Latvia. However, the Russian and Romanian Armies continued to suffer daily defeats despite fierce resistance as they retreated across eastern Romania (26-30) pursued by German, Bulgar and Turkish troops. (Around this time, Tsar Nicholas II’s notorious “advisor” Rasputin was murdered in Moscow – I’ve seen the date of his death quoted as December 19, 21, 29 and 30, so take your pick). No substantial action noted anywhere else, though in a quiet week the outline histories take time to note that the French and British administratively divided Togoland, which they’d taken unopposed from Germany back in August 1914. Last week, my father and a group of fellow underagers were posted to Harrogate, where they found themselves dossing on a dusty floor while very conscious of the genteel wealth that surrounded them. And then they found further cause for unease when they discovered – or credited fake rumours served up by later notorious but as yet unexposed fraudster and magazine publisher Horatio Bottomley MP – that they had joined the “Lost” or maybe “Forgotten Division” which had allegedly spent more than two years at home and never set foot in any war zone. But we’ll leave Sam and pals pondering that situation for the next couple of weeks. Because it’s Christmas and he wrote nothing in his Memoir about the 1916 festivities – just not memorable I guess. 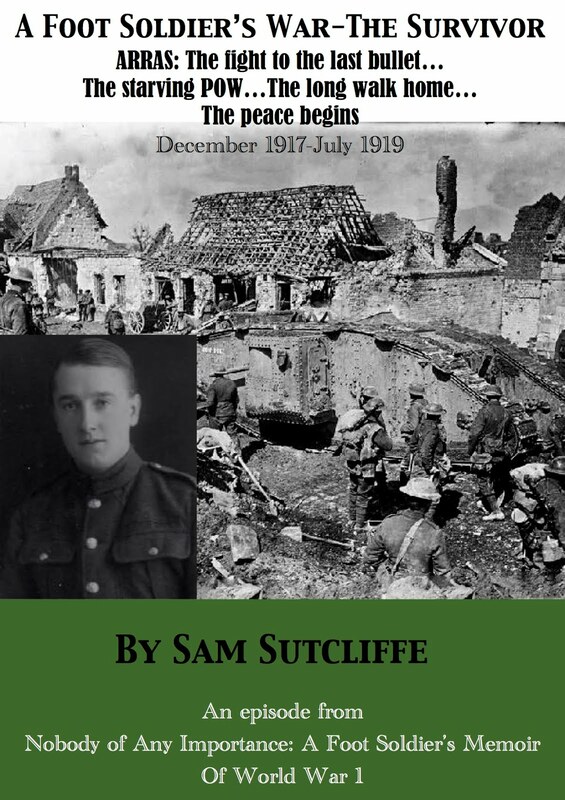 Instead I’ll put together a chunky blog out of stories of earlier Christmases, one from his childhood, then his first in uniform after joining up in September, 1914 – a tale of near-mutiny this – and finally, next week, Christmas and New Year in Gallipoli, 1915. ‘Tommy’s friends, in the main, came from the Scouts or the choir. One was Reg Curtis. In his family it was the custom to wear your hair long. Reg’s Dad and three brothers had thick, wavy hair; I doubt if the father would have let a barber lay his hands on any of them. When Tommy got to know them he realised what a close-knit group they were – the father a deeply religious man with a generous nature, rather dark of countenance, jet-black hair, a cobbler by trade, running a fairly large shop. As soon as the children grew capable of picking up a hammer or a knife, he taught them this craft. But he didn’t overwork them. Nothing of slavery about it. When Tommy went in there he knew at once this was a happy place and a happy home. ‘He hadn’t seen her for several years since, as children of eight or nine, they’d played postman’s knock at a Christmas party her brother Reggie had invited him to. The game involved a boy choosing a girl, or vice versa – Tommy seemed to recall that Bessie had picked him, he couldn’t imagine why – then the two would leave the room to kiss and cuddle (if agreeable) while those left behind giggled and then, on the couple’s return, made saucy comments on what they might have got up to out in the hallway. Now here they were, 15 and meeting again. In the way of such hesitant early steps, the flirtation soon ended in embarrassment for Sam. ‘As Christmas 1914 approached, and it appeared likely the Battalion would remain in England during the holiday, the chaps began to speculate about whether they would be allowed home. “They’re sure to grant two or three days leave,” was the general opinion. So warming anticipation of reunions with families gave rise to a happiness which permeated all the men. Officers must have noticed the prevailing joyfulness but, perhaps, did not realise what caused it. An announcement that Christmas Eve would be free of parades and work contained no reference to leave of absence. Puzzlement and doubt replaced anticipatory elation. Then, as groups of men discussed the strange silence about Christmas plans, anger caused some men to threaten to go home without permission. “But that would be a crime, either desertion with trial by court martial or else a charge of being absent without leave” – so cautious men told the impatient ones. Of course, not all the men had gathered at the railway station, so volunteers offered to go to each CSM and pass on the good news: two-day leave had been granted to all. Thus, the remainder of the men would travel to town by the next train – as Tommy resolved to do. Hurrying back to Leigh Drive, he yelled the good news about Christmas leave to the few men he passed. Mrs Fluter, kindliest of women, said she could have managed easily had the lads been staying over the holiday and she thought her husband might even be disappointed that they were not to share the good times together. Tommy had not seen Churniston** since breakfast, but assumed he also would travel to London. No worry on that score, said Mrs F; she would tell him about the unexpected two days off. With money in their pockets, the brothers bought a turkey in the market place along with fruit, sweets… and Turkish cigarettes, probably costing 4d for ten instead of the usual 2d for English – their rich aroma seemed to lend an air of opulence to that small home. So they all settled down to spend a really happy Christmas together. This might be the last family gathering for several years and, for once, all of them did their utmost to make the occasion memorable – starting that night with the collective manufacture of decorative chains from strips of coloured paper and flour paste. A gay touch in the living room. Mother spent much time at the coal-fired, cooking range. It took skill to stoke it and arrange the dampers so that pots of vegetables on top kept boiling while the bird and stuffing in the oven roasted without burning. Pa had bought a bottle of cheap claret, a favourite of mother’s though, to put it mildly, a bit sharp for the tastes of the youngsters. But all protested that they liked it. Drinking some fizzy mineral water, of which they’d bought several large bottles – “penny monsters” – soon softened its harshness. What with playing games, telling yarns about Army experiences, and resting between unusually large meals, the hours passed quickly. ** Churniston was his billet-mate at the Fluters. *** My father’s alias for Tonbridge. He liked an alias – sometimes to spare living relatives pain or embarrassment and sometimes, as in this case for reasons I couldn’t fathom. 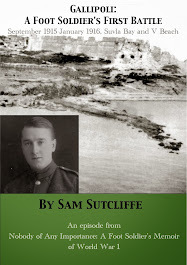 Next week: A surprisingly sumptuous Christmas and New Year at Gallipoli – between evacuations. A hundred years ago this week… The war didn’t go on its holidays, although it slackened off a good deal in the snowy north. The historic landmark fell on this day: the end of the Battle Of Verdun. It started on February 21, the fairly uncertain toll of casualties being calculated at 315-542,000 French soldiers including 156-162,000 dead, and 281-434,000 German including 143,000 dead. After the late success of France’s First Offensive Battle, the struggle concluded with the German presence pushed 4.7 miles back from Verdun itself. Remarkably, on the Eastern Front combined Russian and Latvian forces started The Christmas Battles by attacking the German Army around Jelgava, Latvia, on the frozen Tirelis Swamp (December 23-29). Initially hampered by a Siberian Regiment’s mutiny, the Russian/Latvian push had made little progress by Christmas Eve. But the war in Romania, with the host nation-aggressor beaten, had turned into a sequence of Russian defeats and retreats – around Braila in the east (December 20), and falling back to Bessarabia (23, now Moldova). The Allies’ fight against the invading Bulgars in Macedonia had got stuck after achieving its main objective, Monastir, except that further south the British contingent shelled the mouth of the River Struma (December 22, on the Aegean), and making some progress along the Doiran Front. And down south where snow seldom occurred the Allies’ defence of Egypt took a further step forward with an Anzacs Mounted Division leading an attack which drove the the Ottoman garrison out of Magdhaba (December 23, Sinai peninsula) – 146 Allied casualties, 600 Ottoman. The victory protected railways and water pipeline construction. Last week, my father filled in time by engaging about a dozen recovering wounded comrades in a little light drill and PT on the old parade ground at the Foundlings Hospital. Chatting away he heard unwelcome news about three of his old Fusiliers officers from before the Battalion’s break-up and dispersal at Rouen the previous May – all killed fighting on the Somme Front with whichever outfits they’d been transferred to (including their beloved sometime CO Major Harry Nathan). ‘All change at Leeds, and onwards from there the few miles to Harrogate**, a renowned watering place, as such towns were known then. When I alighted, I saw several other young Tommies strolling about on the platform. We gravitated towards each other and a short chat revealed that the six of us were all in similar situations. We had all served overseas, we had all been sent home because our age meant we should never have left the country as soldiers. And now the Army planned to give us up-to-date training to prepare us for the day when we could legally return to active service abroad. A Corporal met us and immediately surprised us with the news that we had been allocated to a Battalion of the Essex Regiment***. From the beginning, I sensed among my fellows a feeling that we had been degraded. One or two had read in John Bull, the weekly magazine, about what its famous, later infamous editor Horatio Bottomley had branded “The Lost Division”****. This large number of fit men, a force formed quite early in the war, he said, had been allowed to avoid any kind of active service overseas, at the Front in France or anywhere else. Here was something, I felt, about which I’d better think deeply, a trap into which I could easily fall. I could let myself feel aggrieved that, as a former reasonably patriotic lad, I had now been downgraded to the extent that I must soldier on in some phoney way with thousands of men who had evaded their share of the risks of the battlefield; would I be justified in objecting to being placed in this situation? An air of comfortable prosperity emanated from the part of town we walked through to the Battalion headquarters. There, our details were duly noted, then our small group was taken to a parade of shops in the middle of which a door opened into a building of about four floors. We climbed an uncovered stairway, up and up to the top, where we found three rooms with rough and rather dusty, wooden floors and no furniture apart from a few mattresses in each. We were allowed to select whichever one we fancied. I threw my gear down in the front room. ** Harrogate: spa town in North Yorkshire; the Royal Pump Room dates from 1842, but declined after World War I and is now a museum. *** Essex Regiment: founded 1881; 30 Battalions in World War I; battle honours included Le Cateau, Ypres, Loos, Somme, Cambrai, Gallipoli; Ian Hook, Keeper of the Essex Regiment Museum, Chelmsford, kindly researched my father’s Regimental records and found that he transferred to the 2/7th Essex at Harrogate on December 18, 1916, though, soon after, he moved administratively to the 4th (Reserve) Battalion at Halton, Buckinghamshire (a place he never visited, to the best of my knowledge). The 2/5th and 2/7th Essex had been posted to Harrogate in July 1916. **** “The Lost Division”: this reference I’ve found hard to pin down. But a PhD thesis no longer available online did say that “The Forgotten [not Lost] Division” was defamed in John Bull, the weekly “patriotic” magazine edited and owned by Horatio Bottomley, the MP, recruitment demagogue and fraudster, referred to by my father way back in the second FootSoldierSam blog July 19, 1914. The thesis said that Bottomley claimed to have been alerted to the Division’s inertia by letters from “Disappointed Yorkshiremen” i.e. an anonymous source. But the student doesn’t mention which Division Bottomley attacked. Other sources indicate it may have been the 62nd (2nd West Riding) Division; however, according to Fraser Skirrow’s Massacre On The Marne, its entry into action was delayed by a range of missteps and coincidences until lack of action and siphoning off of the fittest men to active units caused a decline in morale with many men seeking transfers; the Division’s training had allegedly been botched under a Lieutenant Colonel Richard A.A. Bottomley – no relation! – so that his men not only remained unfit but many succumbed to lice too; he was replaced in March, 1916. Yet further sources, including the esteemed Long, Long Trail, suggest the Division, or part of it, did move to France and the Western Front in December and January, 1916/17 – and also that they were never stationed in Harrogate! 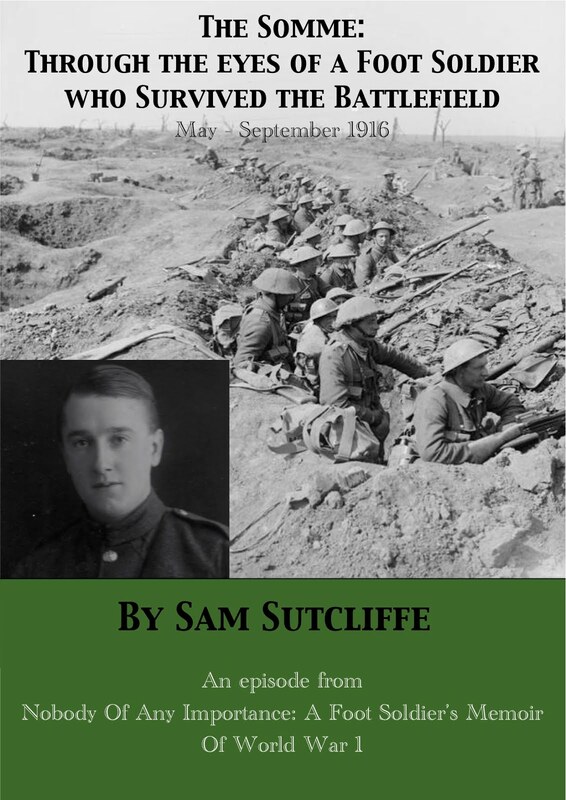 Moreover, the Essex Regiment website lists Sam’s 2nd Battalion as part of the 12th Brigade 4th Division. A tangled web and I don’t pretend to clarity about the facts relating to this ancient controversy which, in some fashion, my father and his comrades stumbled into. 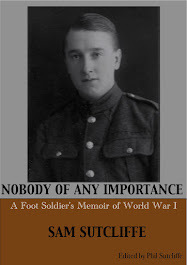 Next week: For December 25, FootSoldierSam on Christmas Day – a Memoir medley of Christmases from before and during the Great War.